Bradbury, who died at 91 Tuesday night, is already earning plenty of tributes. The author of classics such as “Fahrenheit 451” and “The Martian Chronicles” was one of the last living links to an era in early 20th century America in which children got lost in stargazing or pulp magazines like “Weird Tales” instead of video games. There was something magical about Bradbury that went beyond his stories. Talking to him was like taking a Happy Pill. I had a loopy smile on my face hours after talking to him. I felt as if I had hitched a ride on a red balloon floating to the stars. Part of it was his joy and spontaneity – he overflowed with both. It seemed to give him courage in his art and his life. Most of us can relate to the effect children have on adults. Even the grumpiest expressions on adult’s faces evaporate when they see a child giggling and playing. It doesn’t matter if they know the child or not. Talking to Bradbury made you smile. We only talked about 30 minutes because his stamina wouldn’t allow more. There was no guile or calculation in anything he said; he just felt it - and expressed it. Here was a man who, upon meeting Walt Disney, said, “Mr. 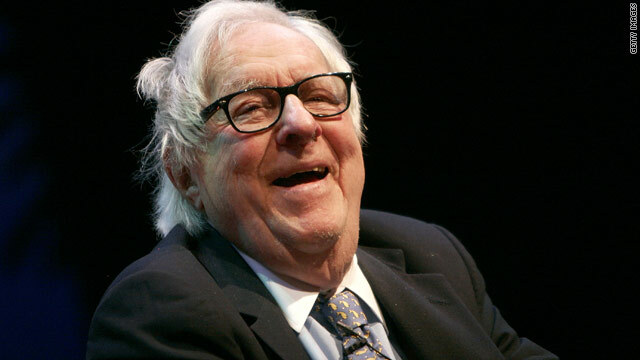 Disney, my name is Ray Bradbury and I love you.” Here was a man who was married 56 years to his muse and late wife, Maggie. Here was a man who loved to eat, laugh and sometimes open his books at night and cry out thanks to God because he was so grateful for his career. I wanted to tell Bradbury how “The Martian Chronicles” had inspired me when I was in high school. I used to write wooden sci-fi stories and force my pouting younger brother to read them. I never worked up the courage to tell him that, though. I suspect he heard plenty of tributes like that over the years. But maybe the best tribute that can be paid to anyone is the reaction I had when I learned he had died. I didn’t feel sad. I smiled and thought, what a wonderful life. Bradbury never stopped stargazing. Near the end of our conversation, he told me that mankind would eventually have to follow his example. We would have to explore the stars because the sun would flame out. I like to think Bradbury is now taking that journey. Liberated from his body, I can imagine his wide-eyed wonder as he hurtles past stars, comets and all the alien worlds he wrote about. Somehow I think the man who jumped off cliffs and built wings on the way down is still soaring. Ray Bradbury has been and always be my favorite author. On his 89th birthday, a mutual friend delivered to him some of my hand-made soap, a tribute to his genius, a way for me to tell him how much I love his work. I am proud to have a picture of Ray, holding two of those bars of soap. Ray Bradbury is one of my favorite writers. He was a true artist of the written word. Thank you for sharing your experience with us. John Blake, I love this article. I first read it the day it was posted. Every time I pass by my bookshelf and catch a glimpse of my Ray Bradbury collection (on the top shelf, of course), I am reminded of the day I found out of Bradbury's passing. Your article made it easier. I have this page bookmarked and I return to it from time to time so I can be reminded of Bradbury's inspiration. I especially loved the ending- "I like to think Bradbury is now taking that journey. Liberated from his body, I can imagine his wide-eyed wonder as he hurtles past stars, comets and all the alien worlds he wrote about." Hi Bhaywood. Thanks so much for your kind words about my tribute to Ray Bradbury. I wrote many articles this past year about heavy subjects – religion, racism, the electin – but writing about Bradbury was my favorite experience. I read my piece again and it made me want to go home and open up by my big Bradbury anthology. I was so blessed to talk to him. Take care. JOHN BLAKE, I loved your article on Ray Bradbury. It was a time machine for me that brought back memories of Ray's calling the Ventura Star-Free Press newspaper, asking for me, or at home, when my wife would answer and wonder who was this Ray Bradbury guy calling? As a young reporter in 1968, he was the first celebrity contact in my professional career. Ray exemplified humility to me and made me glad I chose journalism. I sense, although you're much younger than me, we who follow Ray's comet are members of a big international creative club separated by less than one degree. Richard Bach, another Bradbury devotee, who wrote Jonathon Livingston Sea Gull, once wrote me, "Once you follow Ray's comet, you follow it for life." I'm doubly lucky because, at the same time I was hanging out withy Ray, I was hanging out with Johnny Cash. Cash first invited our newspaper photographer Dan Poush and me to accompany him and June to Folsom Prison for their concert January 13, 1968. I hope your experience with "the last call", along with my experiences (see my CNN blog “Ray Bradbury Will Live Forever”), will inspire many others to call their heroes or make the effort to think big and reach for the stars. With Bradbury type imagination, perseverance and a little luck, they, too, may find themselves talking to their heroes or even becoming lifetime friends. Hey Gene, this is John Blake. Thanks so much for your kind words about my Ray Bradbury post. Wow, Bradbury called you at home? What a treat. I wonder if you had as much fun talking to him as I had talking to him. I used to live in LA so I'm familiar with Ventura County. Thanks again for your kind words. I cherished up to you'll obtain performed proper here. The comic strip is attractive, your authored material stylish. nonetheless, you command get bought an shakiness over that you wish be turning in the following. unwell indubitably come more in the past once more as precisely the similar nearly a lot ceaselessly inside case you protect this increase. More lies without any proof, thanks for proving I am correct, I am a god! "jesus – You are a moron"
Now you're getting closer to the truth. LOL! Nice article: thanks for that. We all miss Bradbury terribly, even though all his books remain – it's the knowledge that he's gone which does it: even though most of us never met him, he was in part responsible for our upbringing. I think we should all get together and try to convince JPL to load his ashes into a Campbell's soup can and include that in the Curiosity mission in August: Bradbury said he wanted to be the first dead person to arrive on Mars, and that he wanted to arrive there in a Campbell's soup can... I wonder if they have room for a few hundred extra grams. That'd be a nice thing to do, I think. In fact, I think I might just go over to JPL tomorrow (they have an Open Day on which you get to meet the scientists in charge of these missions) and ask them to do it. Thanks, Mr. Blake & CNN, for this well written tribute. Well done! What does that have to do with anything? He killed Jews because HE hated them,not because they "killed Jesus". I admit I wasn't so serene when I heard of his passing. Even though he was 91 with such a beautiful story behind him, it hurt like Hell to know he was gone. Ray Bradbury was my inspiration to become a writer. He is one of the only people I have found in this strange world, that thinks the same way I do. And we have quite the age gap. I had always secretly hoped I would meet him someday. Somehow. Unfortunately, I now know that that is impossible. At least on this planet, in this time continuum. I am so saddened and I hope that I can use the emotion to dedicate this week or month to some solid writing in his honor.